As if enough Octagon information didn’t come from today’s press conference in Calgary. On Wednesday evening, the world’s biggest mixed martial arts promotion announced four bouts to the “UFC on FX: Maynard vs. Guida” lineup. 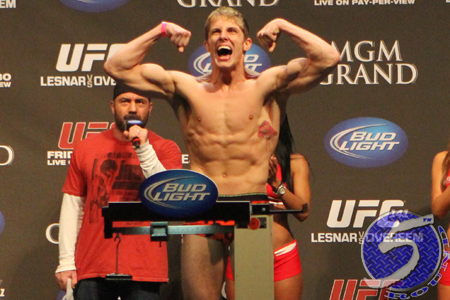 A welterweight scrap between Matt Riddle (Pictured) and Luis Ramos was added to the freebie fight card. Speaking of 170-pounders, Dan Miller has decided to shed 15 pounds and make his welterweight debut against Ricardo Funch. Another welterweight affair featuring Rich Attonito and Rick Story, as well as a middleweight tussle between Chris Camozzi and Nick Catone were confirmed for the roster. The June 22nd event is expected to take place at Revel in Atlantic City, New Jersey.